All photography by Peter Bennetts. It’s 2am in the morning and a child lies awake in bed. She clamps her hands over her ears to smother the shouted abuse she can hear through the thin walls. Only 12 years old, she’s learned all the swear words there are. She squeezes her eyes shut too, but can’t escape the picture of her parents that forms. Beer cans in hand, angry, red in the face. Every year, around 1,000 children are required to attend the Broadmeadows Children’s Court after nights like this. Removed from their homes after a domestic violence incident, they are placed in foster care overnight, often with nothing more than the pyjamas they’re wearing. At Court the next morning, they must wait while their future is decided for them. The Cubbyhouse is their sanctuary, a couple of rooms and a deck tucked into a corner of the new courthouse. 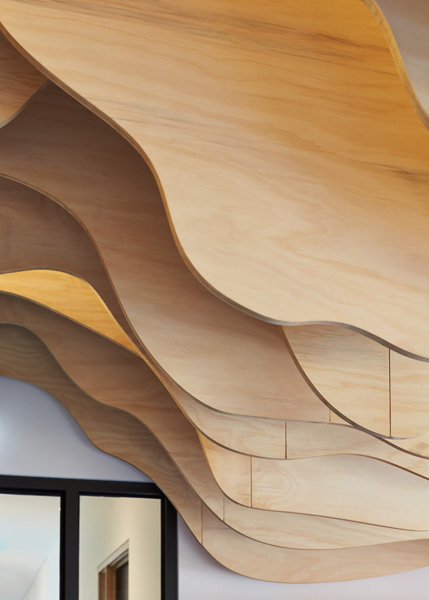 Inspired by traditional Disney cell-animation, it’s an inverted garden of figured plywood. 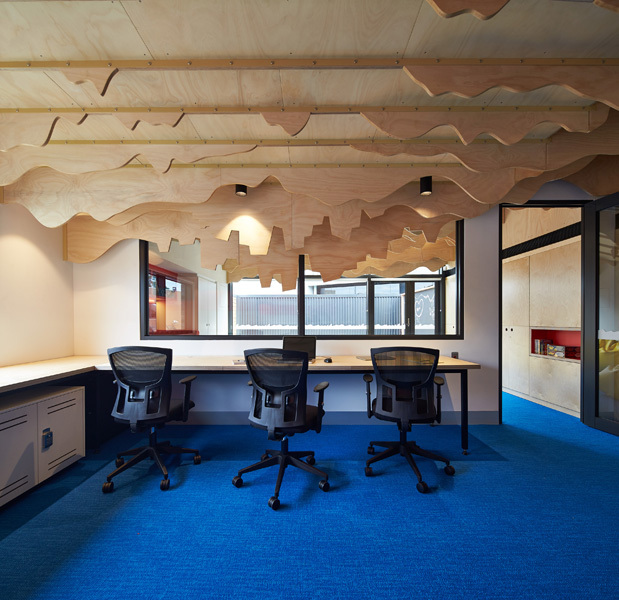 Drawing on the layering technique of cartoons, together with the children’s own upside-down world, it’s a rolling landscape of hills and cities suspended from the ceiling. The carpet is the blue sky underfoot. Home is not a safe place, so the Cubbyhouse is something strange, a source of unexpected delight. 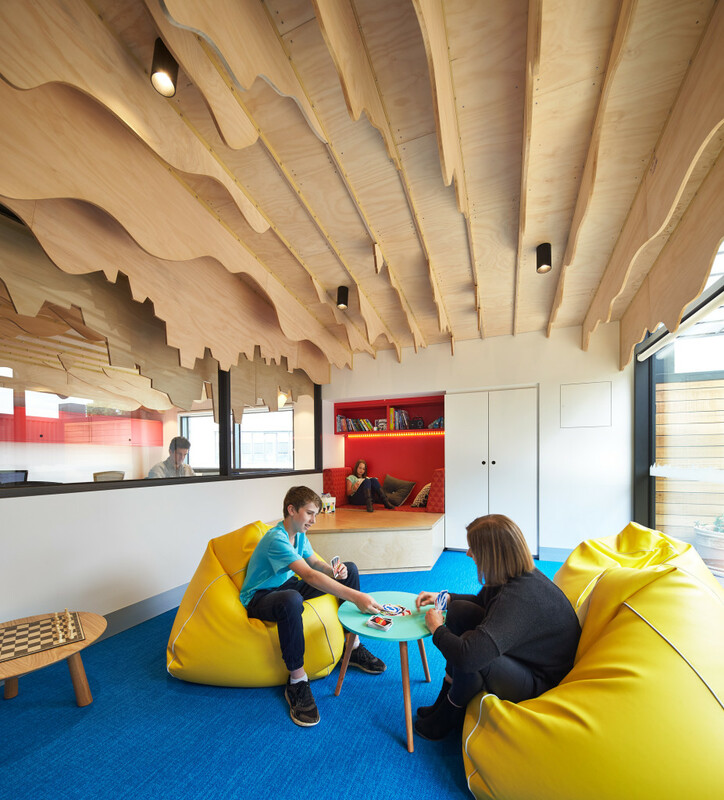 A collection of storage facilities house activities for distraction, and tools for a dedicated youth worker to care for the often disengaged children. There’s a DVD player, boardgames and craft materials. 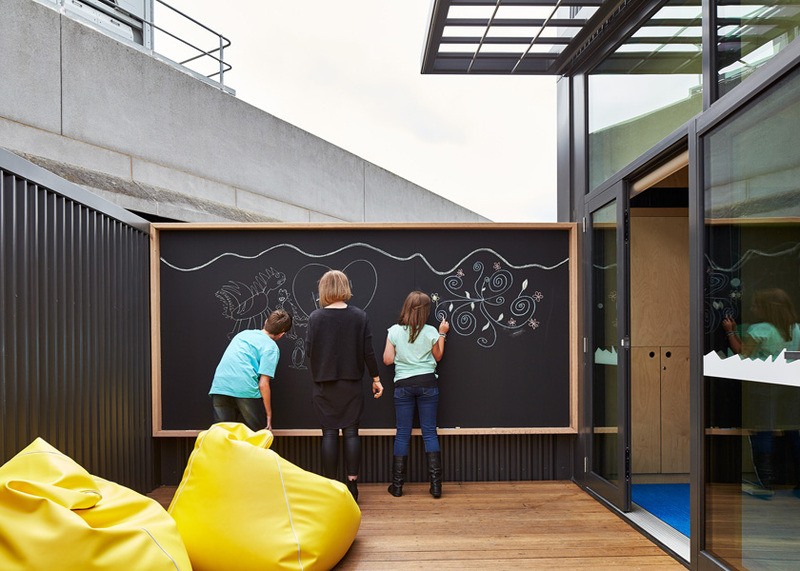 Out on the deck, there’s a blackboard for art and donated pot plants that need gardening. 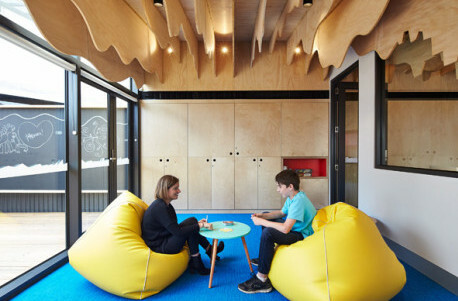 Mihaly Slocombe worked pro-bono in collaboration with the Alannah and Madeline Foundation to kickstart the innovative Cubbyhouse project – a courthouse sanctuary for children affected by domestic violence, the first of its kind in Australia.